The most important element of any filing project is to create an environment for proper storage and ease of retrieval of records and information. 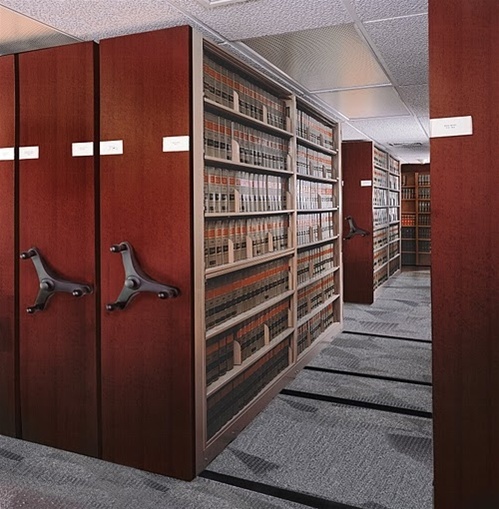 The Kwik-File solution eliminates wasted aisle space by utilizing it to triple the filing capacity compared to what a conventional filing cabinet would provide. Mayline manufactures a complete line of high-density, modular systems that will integrate into any office environment. Our highly trained staff can solve filing and storage problems by analyzing what needs to be stored and how and when it needs to be accessed and handled. Our Mobile Aisle systems provide quick and easy retrieval of side tab media. No heavy drawers to open, no files to thumb through. To take the trouble and worry out of specifying a Mobile Aisle solution, we will do all the up-front work for you. We offer FREE DESIGN SERVICE to not only recommend the best solution, but we will also develop a drawing of your floor plan along with a list of all the materials you need to order...FREE! Call 1-888-632-8480 to begin the process.